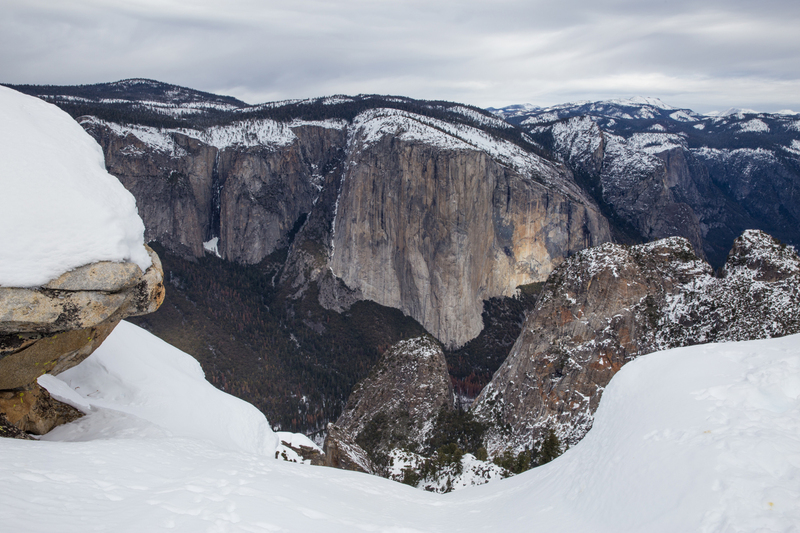 Winter is a magical time to visit Yosemite National Park. The valley is dusted with snow, the waterfalls are icy, the weather is chilly, and the summer crowds have dispersed. If you are lucky, you’ll get to witness the splendor of seeing the clouds roll back to reveal the valley after a winter storm, or maybe catch the last rays of light on Horsetail Falls as they illuminate the water, and it appears to turn into liquid fire. However, one of the drawbacks to visiting in the winter is the snow and ice limit the opportunities for hiking and exploring. Most trails that have any elevation gain are closed, which can be a bit of a bummer if you prefer outdoor adventures over sipping hot cocoa in the lodge. While we love both, on this trip we opted for a snowshoeing adventure! 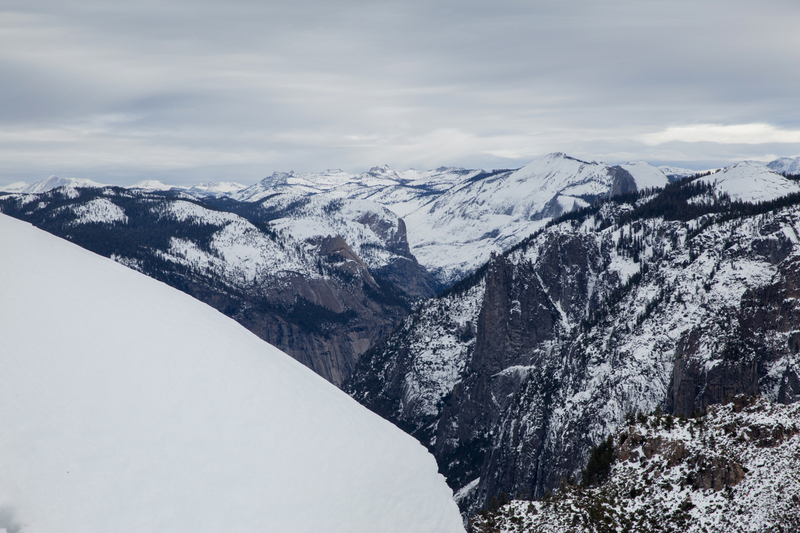 So, when Brian and I visited Yosemite last winter we decided to give snowshoeing a try, and found it to be a fun alternative to hiking. 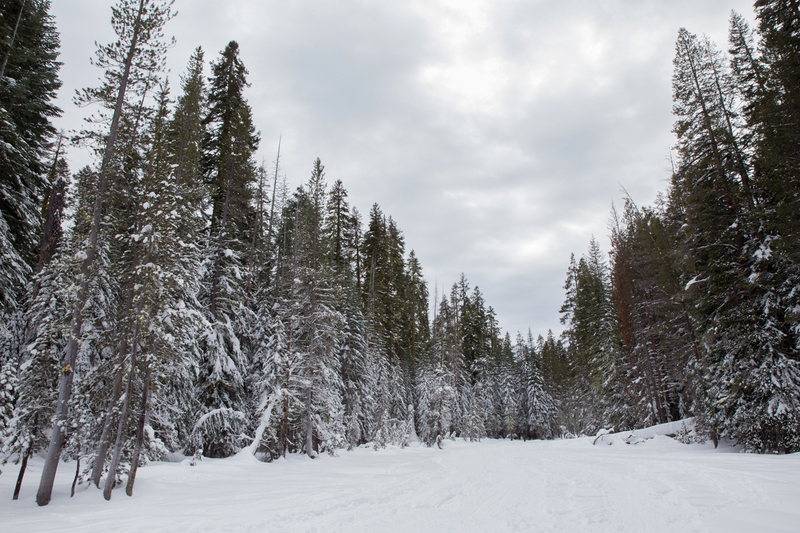 We opted to take the one-hour shuttle ride from the Yosemite Lodge to the Badger Pass Ski Area (Now, renamed the Yosemite Ski Area) so that we didn’t have to worry about driving in the snowy conditions, nor finding parking. 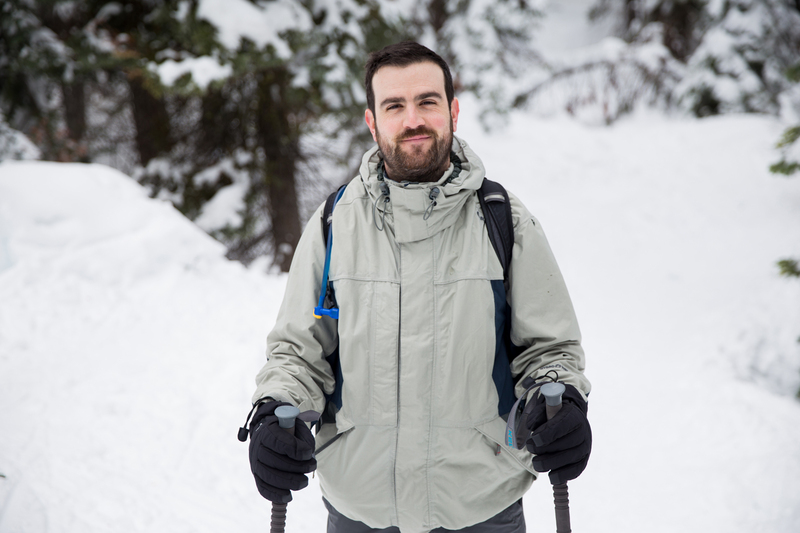 If you don’t own snowshoes, like us, you can easily rent a pair from the rental shop for the day. Current rates are $24.00 for a full day, and $21.00 for a half-day. 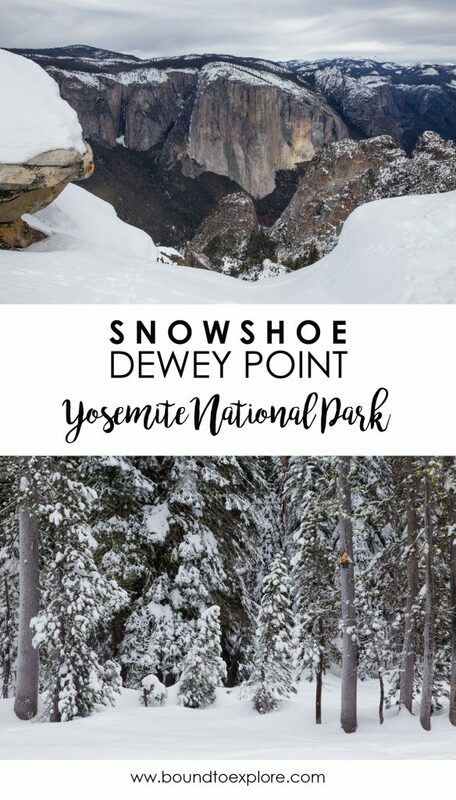 There are several trails in the area for both snowshoeing and cross-country skiing, but we thought Dewey Point would be the most scenic as it takes you 3.5 miles out to the edge of the cliffs overlooking Yosemite Valley. The trail starts right outside of the rental shop, and begins with a slight ascent up the Glacier Point Road for about one mile. There are two trails that intersect with the road, that will take you to Dewey Point. The first you will come across is Ridge Trail, which is a bit more strenuous than Meadow Trail, which you will find just a bit further down the road. We decided to take the easier route since this was our first time snowshoeing. This ended up being a good choice because, while the hike did not have a lot of elevation gain, it was still tiring to trudge through the snow. Also, the Meadow Trail takes you through, get this, a beautiful meadow! 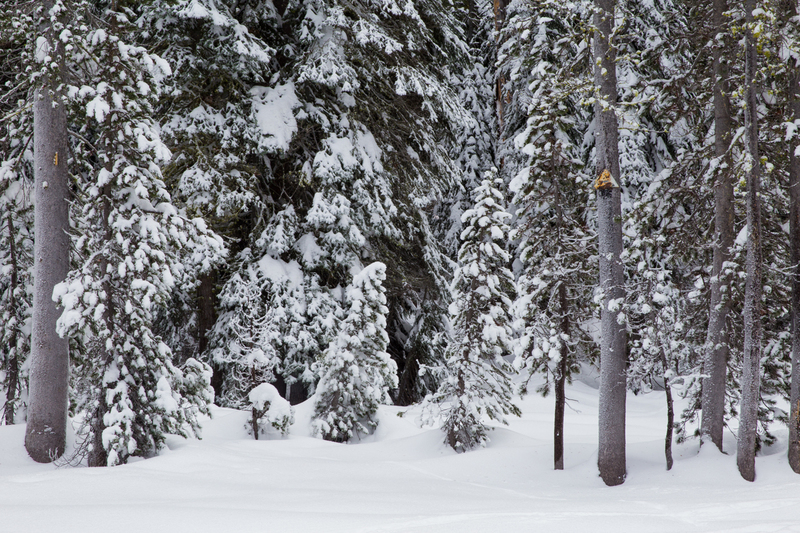 The towering red fir and lodgepole pines were covered in a thick blanket of snow. It was a very peaceful and magical little section of trail. At the end of the meadow the trail turns into the trees, and takes you up and down a series of hills for about another mile. 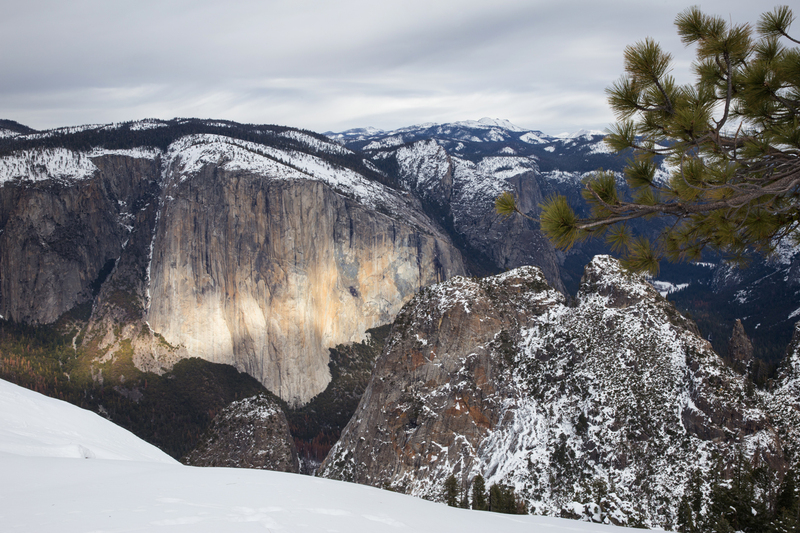 When the trees finally break apart, you will be rewarded with stunning views of Yosemite Valley. After taking in the views and having a snack, we embarked on our journey back. The 3.5 miles in the snow really took a lot of our energy, so we decided to take the Meadow Trail on our return as well (Next time, I would like to try making it a loop, by exploring the Ridge Trail). When we arrived back at the the ski area lodge, we had a pint of beer and shared an order of chicken fingers while we waited for our shuttle. After a long day out on the trail, it was a fantastic treat! Until next time Yosemite! 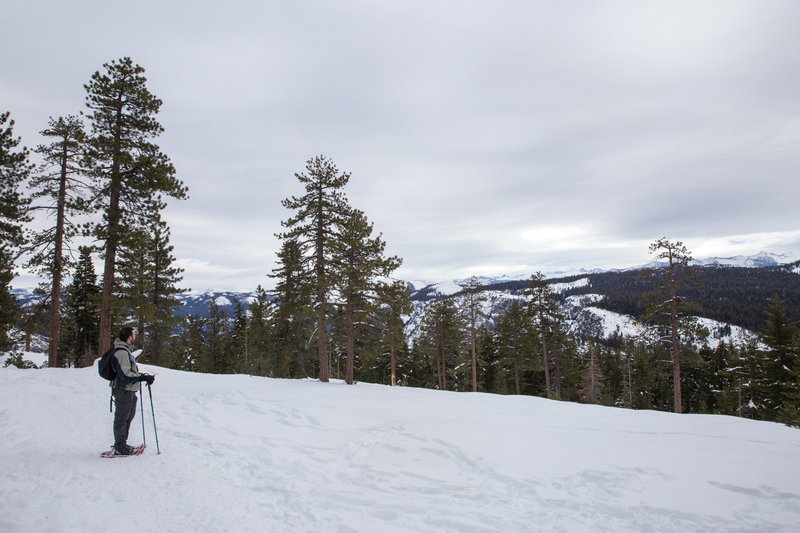 Tip: If you are taking the shuttle, be sure to check the schedule and plan your adventures carefully, as you will most likely have a slower pace snowshoeing than you would hiking. When we went there were two shuttles in the morning up to the ski area (I believe 8:00 a.m. and 10:00 a.m.), and two in the afternoon to take you back (2:00 p.m. and 4:00 p.m.). We thought we would take the early shuttle out and back, but our hike took longer than we anticipated. We ended up getting back to the ski area around 3:00 p.m., so we missed the shuttle we intended to take. Luckily, we still had another option, otherwise we my have been stuck! Hi Julie, great post with wonderful pictures! I will be visiting a few weeks on a solo trip and am interested in doing this hike too, but have never snowshoed, or been to Yosemite, before. Would you think that this would be doable? Was the route was clearly marked? Thank you! Hi Alexandra! If you are an experienced hiker, you should have no problem doing this trip. We had never snowshoed before, and it was fairly easy to pick up. There are signs for the trails, but because the trail was covered in snow, we had to sometimes rely on following the tracks of others. As long as you aren’t the fist one heading out for the day after it snows, you should be fine. Of course, I recommend bringing a map too just in case! It’s a really great adventure, and I am jealous that you are going soon! I miss Yosemite so much! Have fun and let us know how it goes! Hi! I found your blog when researching Yosemite for my trip next month. I think this snowshoe adventure looks so fun, however, my husband and I are first timers and will be wearing our 11 month old. Do you think it’s doable? We’re physically fit, but live in Texas, so not used of the snow! I have no idea how difficult snowshoeing is. Thanks for finding us! Honestly, this hike isn’t very difficult, so if you are physically fit, you’ll be fine. There is very little elevation gain (less than 1000 ft.) and it’s pretty much all just the mileage. When we went, it was our first time snowshoeing and we made it with no trouble. The views when you reach Dewey Point are incredible and you will be so glad you made the trek. Enjoy and let us know how it ends up going!